Kummer surfaces belong to the most famous mathematical surfaces. E.E. Kummer studied them starting in 1864. 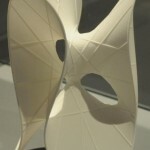 They have 16 singularities which make its shape quite unstable so that we only sell it as a laser-in-glass Math Object. Our sculpture is thus a smoothed version of the Kummer Quartic, i.e. every one of the 16 thin points is replaced by a small “tunnel” or “passage”. Such smoothed Kummer Quartics belong to the class of so-called K3-Surfaces. 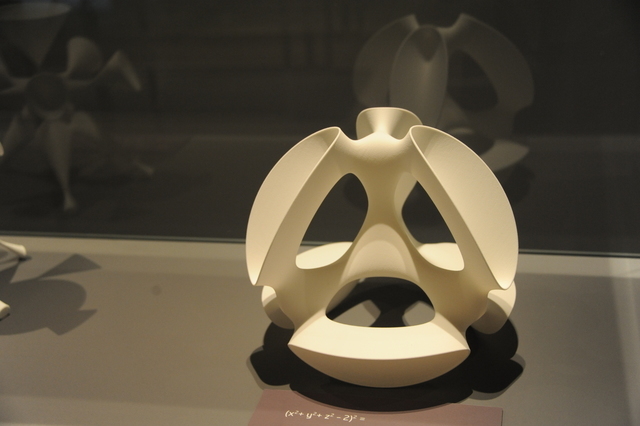 The symmetry is one of the striking geometric features of our Math Object. Kummer surfaces are not necessarily so symmetric, but the symmetric version is certainly one of the most classical ones. The surface actually has the symmetry of the tetrahedron, i.e. those symmetry planes which reflect a regular tetrahedron on itself also reflect the Kummer Quartic on itself. 18.24 €: A Smoothed Kummer Surface, height: 6.9cm (2.7in). 162.07 €: A Smoothed Kummer Surface, height: 19.2cm (7.6in). Attention: These prices include German VAT (19%). Depending on your country, there might be lower or higher costs. Just click on the links above to see the exact prices in your case on our Sculpture-Shop-Site. The Wikipedia Site on K3-Surfaces. The Wikipedia Site on Kummer Surfaces. Stephan Edrass’ site on Kummer Surfaces. E.E. Kummer on the MacTutor History of Mathematicians Archive.